We’ve got the oddest consumer gadgets to pass in a generation! They’re not quite tablets, they’re not quite eReaders, they’re somehow better than both! Not only do these little gadgets confuse and merge 2 markets, but they signifigantly contribute to the death of the printed word! Glourious gadgets indeed….. Lets get past the sarcastic faux circus act and get to the point. This week we’re privvy to the release of not one, but two sub-tablets. The Kindle Fire and Nook Color have both hit the shelves to much fan fare. Android fan-boys are calling them iPad killers, patent trolls are upset since they don’t seem to violate patents, consumers are pleased with the reasonable price points for flashy gadgets, mobile flash is still dying. Before I get to the devices themselves and what I think about them, let me explain my point about these devices being sub-tablet or eReader+. Basically neither the Nook Color, the Kindle Fire, or the Nook Color Tablet have the specs or size to be a tablet. A true tablet, in my opinion, should offer at least enough power to use it as a creation device of some fashion. For example: you can use an iPad to do photo editing, that would seemingly be a pain on a Kindle Fire, and was definately not an option on the first gen Nook Color. On the other hand these devices are clearly more than an eReader. Both Barnes and Noble and Amazon got their start–and their present?–from book sales. It makes sense that they would each come out with an eReader and an eBook store. They both did with their Nooks and Kindles. 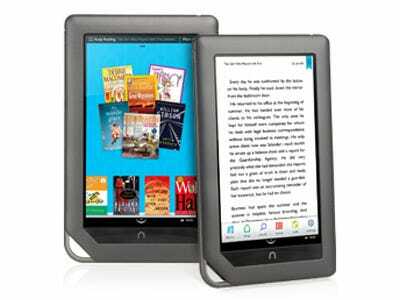 What they’ve done with these new devices (the Nook Color is a year old, I know this) is offer a platform for their eBook stores that also feeds other media and entertainment. They’ve developed pure consumption devices that encompass all entertainment, not just reading. To be fair I don’t have a Kindle Fire. I really want one though. While this isn’t the first sub-tablet/eReader+ it does seem to be the most sought after. The Nook Color was first to market last year with this type of gadget, but other than modders and tinkerers it didn’t recieve a lot of attention. This is where the Kindle seperates itself in the market: it has the attention of power users and causual users alike. Its $199 price point has got grandma jonesin’ for some Angry Birds, and it has little Johnny jonesin’ for some Fire flavored Cyanogenmod. Unfortnately the Fire isn’t without some signifigant limitations. For example: no 3G, bluetooth, or anything beyond WiFi and a single micro USB slot and headphone jack. Kinda lame….but not horrible. As insecure as it is I do love stereo bluetooth headphones. I HATE wires for headphones. I constantly get tangled up when typing or eating. As a developer I do a lot of both of those things, however I don’t think I’d be using the Kindle for my music anyway so no biggie there. The only problem with that is watching movies. If I’m in the living room watching some Breaking Bad on the Fire while the wife is watching Cake Boss on the TV I’d rathr have the BT headphones, but whatever. Other than that you’re getting some pretty paired-down specs with the Fire, but what did you really expect for $199? For that price point, and the enevitibility of the Android community hacking the crap out of it, I’d say the Kindle Fire is a lust-worthy gadget….though not a lust-worthy tablet. So what is different here? Well clearly there is a keychain on the Nook. Winner, winner, chicken dinner!!!! F**k the Kindle, I want the f**king key chain!!! Ok, the keychain thing on the bottom left I’ve never really understood. Why have a random ring? I’ve played with one of these at a Walmart and I gotta tell ya, it doesn’t add anything. It doesn’t really detract either, its just weird. So hardware wise the Nook Color seems to pull ahead but I warn you: all is not that easy with this little eReader+. One thing you have to remember about B&N v. Amazon is that B&N is primarily a book store. As in brick-and-mortar. Amazon started as an online book store, but has evolved into so much more. Amazon has MP3’s, movies, books, cloud services, etc. B&N is still hung up on books only. So with B&N you’ll get a experience tailored to serving (selling) you books. They’ll give you the rest because it entices you into their ecosphere, but make no mistake: they want you to buy books. That said the Nook Color 1st gen got a great port of Cyanogenmod and other Android tweeks. It opened up this whole echosphere of sub-tablets with its $249 price point and easy hackability. If you’re looking for a eReader+ with a tried and true modding method/community you could do worse than to stick with the B&N line of sub-tablets. Similarly if you’re a big reader you could do worse than to stick with a brand whose primary focus is books and magazines. So this wasn’t really a review of either product, more of a generalized opinion of each based on things I’ve read and herd. Take my opinions with a grain of salt, however if you’re mulling the same questions I am regarding these products I hope this blog has helped. In the end I think I’m going to buy a Kindle Fire. The Nook definately made me second guess that choice though. What it comes down to is if I was going to go with the Nook I would have already….I’ve modded many an Android device, but I think I’m over it. I want a device I can be OK with if I don’t hack it. That’s the Kindle Fire. With WiBit being an online tutorial site I figured it would be a good idea to review online schools to see whats out there in a more official capacity.